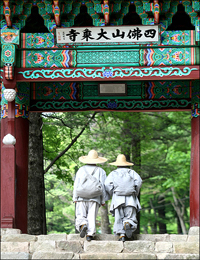 Monks walk into the “Buli-mun” at Daeseung Temple, Mungyeong, South Gyeongsang Province. This is the last gate to the main Buddha hall and is also known as the Gate of Non-duality, which is derived from the Buddhist teaching that truth is nothingbut to be one with all things, forming a unified whole. Korean temples are usually located in mountains and valleys and have three gates. Before arriving at the main Buddha hall, you will pass through all three. These gates symbolize the border between the land of Buddha and the secular world. ``Ilju-mun,'' or One Pillar Gate is the first entry leading into the temple compound. It is usually made with a simple architectural design, consisting of a tiled roof supported by two vertical pillars. A placard will have the name of the temple inscribed on it in Chinese characters. Naturally, the gate must have two pillars to support a roof and form an opening. However, the gate is regarded as having ultimately just one pillar by the viewpoint of Buddha Dharma. This is symbolic of the absolute and immutable truth and also the beginning of the journey toward the pure mind, the first step to reach the land of Buddha. The second gate to the temple compound is the Four Guardian Kings' Gate. This gate is the most memorable, for it contains the four celestial guardians who tower over the pilgrim, two on each side. These spiritual guardians are in charge of the four cardinal directions (north, south, east and west) and the four seasons. They are also concerned with protecting the temple, crushing demonic opponents underfoot. Their ferocious expressions encourage people to bow deeply before them, to observe their minds and rid them of evil thoughts. If your mind is not pure enough to enter into the peaceful world of Buddha's land, these Heavenly Kings might not let you go through the second gate. While these figures have a more ferocious mien in Chinese and Japanese gates, Korean guardians are known for their more endearing attempt at ferocity, rendered as they are with broad faces and large eyes. Imposing as they may be, towering some tens of feet over the visitors, according to ancient Buddhist cosmology from which they derive, they in fact stand approximately 750 feet tall and live 9 million years, for they are not earthly beings, as they are depicted in the sculptures in the gate, but powerful and long-lived Devas. The four celestial guardians stand at the four cardinal points of Mt. Sumeru, the cosmic mountain in the center of the universe, according to ancient Buddhist cosmology. These protectors were present at the birth and other significant events in the life of Buddha. Vaisravana, the guardian of the north, is their captain, and is recognized by the pagoda he holds in his hand. Virudhaka, defender of the south, holds a sword. Dhritarashtra, warden of the east, holds a stringed instrument. Virupaksha, keeper of the west, holds a serpent. The last gate to the main Buddha hall is called ``Buli-mun," or Gate of Non-duality, which is derived from the Buddhist teaching that truth is nothing but to be one with all things, forming a unified whole. In other words, all the ostensive dualities such as birth vs. death, good vs. evil and love vs. hate are not two but only one. It is the intent of ``Seon" practice after all to eliminate dualistic thinking - that discriminatory tendency whereby we parse self from the world and others, self from our Buddha-nature, and so on, thus getting rid of our selfishness and working helpfully with the interconnected universe. The Vimalakirti Sutra is a Buddhist sutra close to the hearts of Seon monks. It is a narrative about a sage householder who lived at the time of the Buddha and who is famous in the sutra for besting even the bodhisattvas, beings on the path to Buddhahood in the penetrating and witty repartee that comprises the text. In the chapter entitled "The Dharma-Door of Non-Duality," the discussion is on the question of how a bodhisattva is to enter the dharma-door of non-duality thus attaining Buddhahood. Many bodhisattvas express very wise opinions on this matter. When it is Vimalakirti's turn to contribute his thoughts, he remains silent, thus expressing in subtlest terms the profound silence of enlightenment. This is the very silence that is sought through the gate of non-duality, at the heart of the temple. Entering the final gate or ``Buli-mun," you may be freed from all earthly delusions, agonies and evil passions, and thus this gate is also referred to as ``Haetal-mun," or the Gate of Liberation, that leads to the door of Nirvana after attaining the three cores of emptiness, formlessness and wishlessness. These three gates of temples are also called ``Mountain Gates." Now, as almost all Korean temples are manifesting beautiful summer scenery, you may have the luck to pass through all three gates and connect to the Buddha Dharma more deeply through recalling the deep meaning behind them. The writer is a senior researcher at the Korea Institute of Buddhist English Translation. - ED.